It seems that dozens of cookbook authors have stepped onto the bandwagon to present books that feature recipes that are mostly plant-based, gluten-free, vegan or vegetarian, etc. Shut Up and Cook! : Modern, Healthy Recipes That Anyone Can Make and Everyone Will Love is one of these cookbooks, touting recipes that are healthy for everyone, even those with special diets. 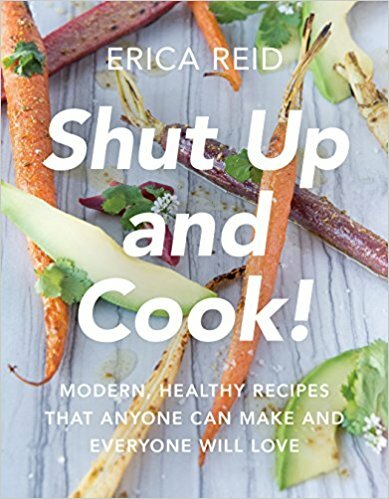 And while the author, Erica Reid has reasons for the title “Shut Up,” meaning stop making excuses and start to cook healthy, the phrase is still demeaning (growing up we were not allowed to tell each other to “shut up,” so this has a negative connotation for me), and is a definite turn-off to me as far as this cookbook. Even with the negative title, Reid has a cute personality and it shows through in her vignettes and musings between and in the introductions to the recipes. Her philosophy of cooking healthy is good and probably worth adapting for those who have family members with special diets. However, the recipes aren’t really designed for mainstream cooks who don’t feed people with special needs, and although the recipes are probably appealing to those with special diets, they aren’t particularly exciting to those of us who just feed normal people with normal dietary needs. The recipes are well-written and easy to understand. Most call for ingredients that are easy to obtain, and most of the ingredients are healthy and could be a benefit to everyone. Reid’s recipe for Jerk Chicken was very good, although I substituted breasts for the thighs and drumsticks since we don’t like dark meat, and we also loved the very easy and refreshing Orange and Fennel Salad. Reid chooses to omit beef and pork from her family’s diet, so there are no recipes for these meats in the book. However, there are recipes for turkey, lamb, chicken, and fish (the Ginger Salmon is quite good and it’s quick and easy). She also uses turkey bacon. All told, this is a cookbook that will appeal mostly to people who must keep special diets in mind when cooking. The pictures are nice, and some of the recipes will appeal to everyone, but it probably won’t be a favorite “go-to” cookbook when deciding on something quick, easy, and appetizing to make for dinner.